Photograph taken 14 August 2011. Absaroka is the Indian name for the Crow nation -- the children of the large beaked bird This range of mountains form the southeastern boundary of Yellowstone National Park. Lakes, creeks, and runoff from these mountains help form the headwaters of the Wind River. These rugged rock peaks of the Absaroka Range are 120 miles away. Field Notes: 14 Aug 2011. Wyoming Highway 135, "Sand Draw Road," Wyoming: at vista point. 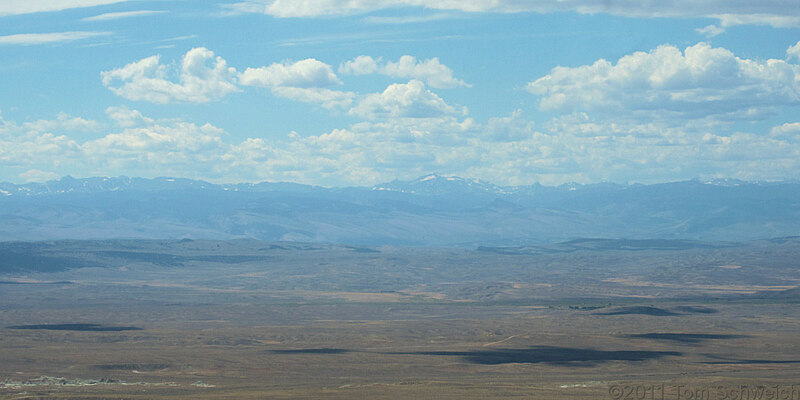 Other photos about Geography - Wyoming or Fremont County.